“It only took a split second.” These were the words of a friend who shared with me a story that still haunts her today. Her 18-month-old daughter had accidentally taken her husband’s heart medication. Even though the pills were properly stored and locked, one must have dropped on the floor. Her toddler found it and put it in her mouth. Luckily, she was able to act quickly. Her daughter was okay. But it left my friend feeling guilty and scared at the thought of what could have happened. Stories like this are more common than you might think. Medication is the leading cause of poisoning in children. Poison centres across Canada receive about 160,000 phone calls each year from frantic parents. 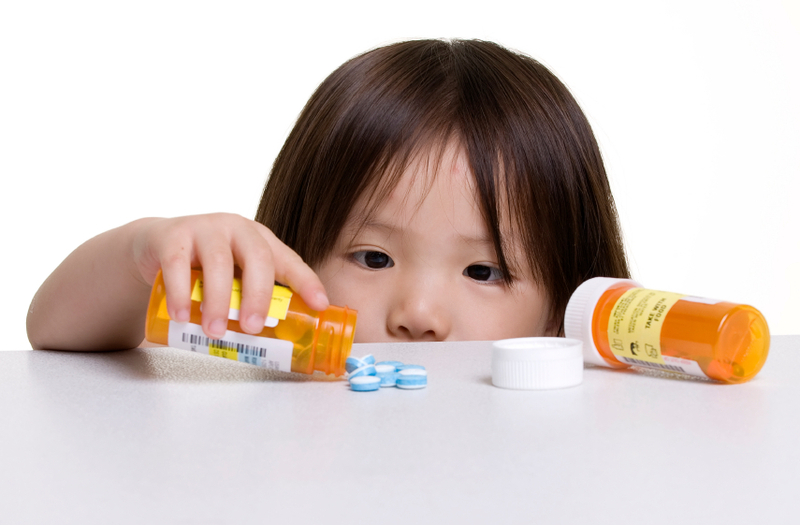 Nearly half of all poisonings occur in children younger than six years old and most happen in the home. Young children are naturally curious; they love to explore their surroundings by touching and putting things in their mouth. Children are attracted to colours, scents and labels – similar to what you find in products like cleaners, shower gels, detergents and laundry pods. The tragic accidental poisoning of four young children in Alberta highlighted just how vulnerable kids are in their own home. So how do we make things safer for our kids? The first step is to identify what’s poisonous to your child. We know of several household products that are frequent culprits in accidental poisoning, such as medications, detergents, cleaners and bleaches. But often we don’t think about the less obvious substances – cosmetics, mouthwash, nail polish, baby oil (which can be dangerous to a child’s lungs), vitamins, batteries, plants, windshield washer fluid, pesticides and insect repellent. These are all common substances ingested by children. Many of you may have already taken steps to keep your home a poison-free zone. Never put cleaners in containers used for drinking, such as water bottles or pop cans. Keep purses out of reach from young children – the contents can be dangerous. Don’t mix cleaning products together; harmful fumes can result. Be especially careful not to mix chlorine bleach with an acid or ammonia. Don’t forget about the garage! Lock up pesticides, insecticides, fertilizers or other lawn or garden products – don’t leave them unattended when in use. Teach children not to put leaves, flowers, seeds, nuts or berries in their mouth without first checking with an adult. Supervise! Supervise! Supervise! Even the most thorough childproofing is no substitute for supervision. If you think your child has ingested a toxic substance, don’t induce vomiting. If the child is unconscious, convulsing, or having trouble breathing or swallowing call 911 immediately. If your child has mild or no symptoms, call the Ontario Poison Centre at 1-800-268-9017 for information. By taking these steps to recognize poisonous substances, childproof your home and supervise your kids, you may be able to avoid a potentially dangerous or tragic situation. Do you have a poison prevention tip or story to share? This entry was posted in Babies, Keeping Your Baby Safe, Keeping Your Toddler & Preschooler Safe, Parenting, Parenting Your Baby, Parenting Your Toddler & Preschooler, Play, Growth & Development, Play, Growth & Development for Babies, Toddlers & Preschoolers and tagged accidental poisening, childproofing, children, children and poisening, grandparents, ingested, kids, medications, parents, Physical Health, poisening, prevention. Bookmark the permalink.